Save Outlook emails as PDF, DOC, TIFF right in Outlook! Save Outlook emails as PDF files in one click! Coolutils Outlook Plugin is an intergarted email converter. It plugs seamlessly into your Outlook and you can get a PDF or TIFF copy of any email with just one click! The list of supported file types is not limited to PDF or TIFF only. Convert Outlook emails to PDF, HTML, XHTML, TXT, TIFF, JPEG, EML in one click. Give new descriptive names with macros. Process attachments in the way you need. Add page counters, stamp bates, apply your logo to the output files. You get one small button in Outlook panel that makes all the job to convert emails. No expensive Acrobat or any third-party solutions are required. Archive emails, save them outside Outlook for future reference or legal compliance, reduce mailbox size - all done with one click! Buy your copy now and start getting accurate copies of your emails exactly where you need, right in your email app. All Outlook versions are supported. 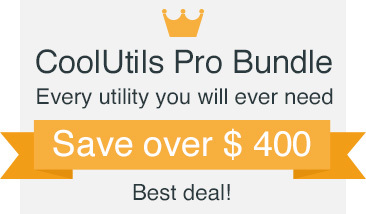 "This little plugin saves me hours each week in productivity! I save emails as PDFs in one click without additional steps. I don't have to export emails and convert them in another email converter. All I have to do is to press one button. Fantastic!" "We have been very pleased with the Coolutils Outlook Plugin. We use it to archive emails as PDF files as our system does not accept EML files. The plugin simplifies the overall process a lot. Thank you!" Outlook emails to PDF, DOC, TIFF, TXT, JPEG, HTML, XHTML.